The conference was not successful in persuading Britain to take up economic sanctions against South Africa though. Rather, the British government "remained firm in its view that the imposition of sanctions would be unconstitutional 'because we do not accept that this situation in South Africa constitutes a threat to international peace and security and we do not in any case believe that sanctions would have the effect of persuading the South African Government to change its policies'". The AAM tried to make sanctions an election issue in the 1964 General Election in Britain. Candidates were asked to state their position on economic sanctions and other punitive measures against the South African government. Most candidates who responded answered in the affirmative. After the Labour Party sweep to power though, commitment to the anti-apartheid cause dissipated. In short order, Labour Party leader Harold Wilson told the press that his Labour Party was "not in favour of trade sanctions partly because, even if fully effective, they would harm the people we are most concerned about - the Africans and those white South Africans who are having to maintain some standard of decency there". Even so, Lisson writes that the "AAM still hoped that the new Labour Government would be more sensitive to the demands of public opinion than the previous Government." But by the end of 1964, it was clear that the election of the Labour Party had made little difference in the government's overall unwillingness to imposing sanctions. In 1977, the voluntary UN arms embargo became mandatory with the passing of United Nations Security Council Resolution 418. An oil embargo was introduced on 20 November 1987 when the United Nations General Assembly adopted a voluntary international oil embargo. Knight writes that anti-apartheid movement in the U.S. found that Washington was unwilling to get involved in economically isolating South Africa. The movement responded by organized lobbying of individual businesses and institutional investors to end their involvement with or investments in the apartheid state as a matter of corporate social responsibility. This campaign was coordinated by several faith-based institutional investors eventually leading to the creation of the Interfaith Center on Corporate Responsibility. An array of celebrities, including singer Paul Simon, also participated. In a total rejection of apartheid, black South Africans mobilized to make the townships ungovernable, black local officials resigned in droves, and the government declared a State of Emergency in 1985 and used thousands of troops to quell "unrest". Television audiences throughout the world were to watch almost nightly reports of massive resistance to apartheid, the growth of a democratic movement, and the savage police and military response. The result of the widely televised South African response was "a dramatic expansion of international actions to isolate apartheid, actions that combined with the internal situation to force dramatic changes in South Africa's international economic relations". Students organized to demand that their universities "divest", meaning that the universities were to cease investing in companies that traded or had operations in South Africa. At many universities, many students and faculty protested in order to force action on the issue. The first organized Anti-Apartheid Organization on University Campuses in the United States was CUAA founded at the University of California Berkeley by Ramon Sevilla. Sevilla was a principal organizer that had support from Nelson Mandela, with whom Sevilla was in communication while Mandela was imprisoned on Robben Island in South Africa as well as with The African National Congress (the ANC). Some of the most effective actions in support of the divestment of investments of U.S. companies doing business in South Africa took place between the years of 1976 and 1985, as Sevilla travelled throughout the American Continent and Europe gathering support for the overthrow of the South African Apartheid Government, which also led to his arrest at U.C. Berkeley on several occasions in the successful effort to force the University of California to divest all of their investments in companies doing business in South Africa, which also became the driving force for divestment worldwide in all companies doing business in the country of Apartheid South Africa. For example, in April 1986, 61 students were arrested after building a shantytown in front of the chancellor's office at UC Berkeley. Smith College, in Northampton, Mass., which is connected to Hampshire College in Amherst, Mass., through the Five College Consortium engaged with divesting from South Africa several years later. In the spring semester of 1986 students at Smith College protested the Board of Trustee's decision not to fully divest the college's endowment from companies in South Africa. Student protests included a sit-in in College Hall, the main administrative office which included nearly 100 students sleeping in over night on 24 February 1986. The next day students staged a full blockade of the building, not allowing any staff into the building and anticipating arrest, though the President of the college at the time, Mary Maples Dunn, refused to have the students arrested. A comprehensive list of the demands they made throughout the demonstration was published on 28 February 1986, at 8:30 am. The "Women at College Hall" agreed to end the blockade if The Board of Trustees agreed to "issue a statement of intent to deliberate again, with a quorum, the issue of divestment" before Spring Break, and that the Investor Responsibility Committee would meet with representatives from the South African Task Force, the Ethical Investment Committee, and students from the Divestment Committee to look at "a restructuring of the investment policy". Students also demanded that the Board of Trustees “recognize the need for more dialogue with the Smith College community” and that they act on this with more meetings and transparency. In relation to the action, students demanded that a required teach-in be conducted to educate the college and the Board of Trustees on divestment, South African apartheid, and the College Hall Occupation, in addition, a booklet would be compiled by the demonstrators that would be distributed to the college to educate the community on the movement. They also demanded that the president grant amnesty to anyone who directly or indirectly participated in the occupation. On 1 March 1986, the protest ended when negotiations with administrators led to an agreement that the trustees would re-evaluate their decision, a mandatory teach-in would be held, and amnesty would be granted to anyone involved in the demonstration. After student pressures, Smith College voted to divest all $39 million in stocks that they held in companies working in South Africa by 31 October 1988. Throughout the 1980s, Harvard professors for the most part avoided involvement with South Africa in protest of apartheid, and then president Derek C. Bok was a vocal supporter of work by the U.S. to prompt reform in South Africa. But the University was slow to pull its own investments out of companies doing business in South Africa, insisting that through its proxy votes, it could more effectively fight apartheid than by purging stocks from its portfolio. But after a decade of protests, Harvard did adopt a policy of selective divestment, and by the end of the 1980s was almost completely out of South Africa. At the UC Berkeley campus, student organizations focused on a campaign of civil disobedience, with 38 students arrested in 1984, a semester-long sit-in protest with 158 arrests in 1985, and a shantytown protest April 1-4, 1986 that resulted in a violent confrontation between protesters and police and 152 arrests. The University of California, in contrast to the limited action undertaken by Harvard, authorized in 1986 the withdrawal of three billion dollars worth of investments from the apartheid state. Nelson Mandela stated his belief that the University of California's massive divestment was particularly significant in abolishing white-minority rule in South Africa. 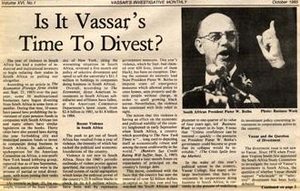 In 1989, after a three-year review by the Gettysburg College Board of Trustees and a five-month campaign by the Salaam Committee—a campus group made up of students and faculty--the college voted to divest $5.4 million from companies connected to South Africa. In addition to campuses, anti-apartheid activists found concerned and sympathetic legislators in cities and states. Several states and localities did pass legislation ordering the sale of such securities, most notably the City and County of San Francisco, which passed legislation on June 5, 1978 not to invest "in corporations and banks doing business in or with South Africa". The result was that "by the end of 1989 26 states, 22 counties and over 90 cities had taken some form of binding economic action against companies doing business in South Africa". Many public pension funds connected to these local governments were legislated to disinvestment from South African companies. These local governments also exerted pressure via enacting selective purchasing policies, "whereby cities give preference in bidding on contracts for goods and services to those companies who do not do business in South Africa". Knight attributes some of the increase in imports in 1988 to lax enforcement of the 1986 Act citing a 1989 study by the General Accounting Office. Knight writes that a "major weakness of the Act is that it does little to prohibit exports to South Africa, even in such areas as computers and other capital goods". An additionally and much harsher sanctions bill was passed by the House of Representatives (Congress) in August 1988. This bill mandated "the withdrawal of all U.S. companies from South Africa, the sale by U.S. residents of all investments in South African companies and an end to most trade, except for the import of certain strategic minerals". In the end, the bill didn't become law as wasn't able to pass the Senate. (In the United States legislative system a bill must be passed by both the Senate and the House of Representatives before it can be signed into law by the President.) Even so, the fact that such a harsh bill made any progress at all through the legislature "alerted both the South African government and U.S. business that significant further sanctions were likely to be forthcoming" if the political situation in South Africa remained unchanged. While disinvestment, boycotts and sanctions aimed at the removal of the apartheid system, there was also considerable opposition from within the anti-apartheid movement within South Africa coming from both black and white leaders. Mangosuthu Buthelezi, Chief Minister of KwaZulu and leading black figure slammed sanctions, stating that "They can only harm all the people of Southern Africa. They can only lead to more hardships, particularly for the blacks." Well known anti-apartheid opposition MPs Helen Suzman and Harry Schwarz also strongly opposed moves to disinvest from South Africa. Both politicians of the Progressive Federal Party, they argued that disinvestment would cause further economic hardships for black people, which would ultimately worsen the political climate for negotiations. Suzman described them as "self defeating, wrecking the economy and do not assist anybody irrespective of race". Schwarz also argued that "Morality is cheap when someone else is paying." Many criticised disinvestment because of its economic impact on ordinary black South Africans, such as British Prime Minister Margaret Thatcher, who described sanctions and disinvestment as "the way of poverty, starvation and destroying the hopes of the very people — all of them—whom you wish to help." John Major, then her Foreign Secretary, said disinvestment would "feed white consciences outside South Africa, not black bellies within it", although in 2013, he said that the Conservative Government led by Margaret Thatcher was wrong to oppose tougher sanctions against South Africa during the apartheid era. ^ "The Fergusson Years: Vassar, 1986-2006" Archived 28 March 2007 at the Wayback Machine, Vassar College Libraries Archives & Special Collections. Poughkeepsie, NY. 2006. ^ See the debate in Nature: "Boycott of Israel? It worked for South Africa", Steven Rose and Hilary Rose, Nature, volume 417, p. 221 (2002) and the response "Did an academic boycott help to end apartheid? ", George Fink, Nature, Volume 417, Issue 6890, p. 690 (2002). ^ "Policies of apartheid of the Government of South Africa & International solidarity with the liberation struggle in South Africa". United Nations General Assembly. 1987-11-20. Retrieved 2015-07-29. ^ "Around the Nation; 61 Arrested at Berkeley in Protest of Apartheid". The New York Times. AP. 1986-04-02. ^ Schutt, Randy. "A Powerful and Inspiring Campaign: A Short History of SCRIP's Efforts to End Stanford University's Support of South African Apartheid in 1977". Vernal Education Project. 1998-02-03. ^ D. (pseudonym), Bob. "Students Organize Against Stanford's Investment Policy". Grapevine. Volume 5, Number 6. Palo Alto, Calif. June 1977. ^ "Columbia Senate Supports Selling South African Stocks Selectively". The New York Times. 1978-05-07. ^ "Michigan Law on South Africa Investments Upset". The New York Times. 1988-02-04. ^ David Rosenberg (1978-06-08). "Trustees vote for divestiture from backers of S. African government". Columbia Spectator. p. 1. ^ Mary Alice McDonaugh (1977-03-03). "400 sign petition against offering Kissinger faculty post; Anthony Lewis of the Times also blasts former Secretary". Columbia Spectator. p. 1. ^ "Demonstration at Columbia". New York Daily News. 1978-05-02. ^ "Student Sit-in at Columbia". New York Post. 1978-05-02 – via Getty Images. ^ "Clark, Smith Decide to Divest". The Harvard Crimson. Retrieved 12 April 2016. ^ a b Smith College Archives. "College Hall Occupation Oral History Project". 5 College Archives and Manuscript Collections. Smith College Archives. Retrieved 12 April 2016. ^ "AROUND THE NATION; Smith College to End South Africa Investments". The New York Times. 1986-10-28. Retrieved 12 April 2016. ^ a b A CONFLICTED RELATIONSHIP: Harvard supported South Africa through investments, but partially divested under protest Archived 7 September 2007 at the Wayback Machine in Harvard Honors Nelson Mandela Archived 13 June 2007 at the Wayback Machine. Adam A. Sofen and Alan E. Wirzbicki. ^ White, Lauren (30 September 2016). "1990: Students Take Action to Protest Apartheid". ^ Milk, Harvey (2012). The Harvey Milk Interviews: In His Own Words. Vince Emery Productions. ISBN 978-0-9725898-8-8. , p. 328. ^ Rothbard, Murray. "The Crusade Against South Africa". Making Economic Sense. Chapter 90. Auburn, AL: Mises Institute, 1995. Online Edition, Accessed 19 November 2009. "For U.S. Firms in South Africa, The Threat of Coercive Sullivan Principles". Heritage Foundation. 12 November 1984. "On 'Constructive Engagement' in South Africa". The MIT Tech. 105(47). 5 November 1985. "The Choice for U.S. Policy in South Africa: Reform or Vengeance". Heritage Foundation. 25 July 1986. "Misconceptions about U.S. policy toward South Africa". US Department of State Bulletin. September 1986. Richard Knight. Chapter: "Sanctions, Disinvestment, and U.S. Corporations in South Africa". Sanctioning Apartheid (Africa World Press). 1990. "Disinvestment from South Africa: They Did Well by Doing Good". Contemporary Economic Policy. XV(1):76-86. January 1997. Robert Kinloch Massie, Loosing the Bonds: The United States and South Africa in the Apartheid Years, Doubleday, New York, 1997. African Activist Archive - more than 7,000 documents, posters, T-shirts, buttons, photos, video, and memories of activism in the U.S. to support the struggles of African peoples against apartheid, colonialism, and social injustice, 1950s-1990s. Also includes a directory of African activist organizations across the U.S. This page was last edited on 17 April 2019, at 00:10 (UTC).